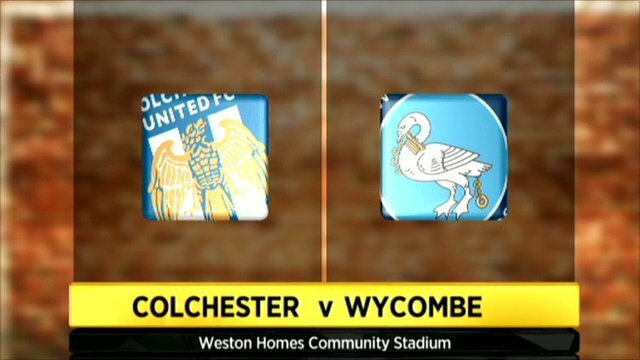 Colchester suffered their first home defeat in six months as League Two Wycombe produced a shock victory. Goals from Kevin Betsy and Scott Davies took Wycombe into the area quarter-finals of the Johnstone's Paint Trophy. Betsy put the visitors ahead when he collected a Matt McClure pass, rounded Ben Williams and tapped into the net. Ian Henderson was wasteful for Colchester before Davies sealed the victory when he finished off after Williams had parried from Ben Strevens. "We've gone forward enough times, particularly in the first half and played some really good football up to the box, delivered the ball and not finished it off. "So you could really put my interview out from Saturday or the previous Saturday rather than this one. "I was also disappointed late on when we've given up the ghost a little bit and made some tired decisions - we've looked a bit tired at the end of the game and that bothers me a bit." "We had the drawing habit not so long ago. "It's a great result for us, we've performed against Colchester who have started the league campaign extremely well. "This is a hard place to come to, they put us under a hell of a lot of pressure." 90:00+5:08 The referee signals the end of the game. 90:00+3:29 Free kick awarded for an unfair challenge on Thomas Bender by Kieran Murtagh. Direct free kick taken by Anthony Wordsworth. 90:00+2:54 Free kick awarded for an unfair challenge on John White by Lewis Montrose. Direct free kick taken by Ben Williams. 90:00+2:11 Free kick awarded for an unfair challenge on Lewis Montrose by Ian Henderson. Direct free kick taken by Nikki Bull. 89:04 Scott Davies has an effort at goal from deep inside the penalty box that bounces off the post. 88:18 Free kick awarded for a foul by John White on Kevin Betsy. Free kick taken by Andy Sandell. 88:18 Booking John White goes into the book for unsporting behaviour. 86:31 Kevin Betsy decides to take a short corner. 85:37 Free kick awarded for an unfair challenge on Thomas Bender by Matt McClure. Free kick taken by Thomas Bender. 83:25 Thomas Bender concedes a free kick for a foul on Ben Strevens. Scott Davies restarts play with the free kick. 81:06 Assist by Kevin Betsy. 81:06 GOAL - Scott Davies:Colchester 0 - 2 Wycombe Scott Davies gets on the score sheet with a goal from inside the area to the bottom right corner of the goal. Colchester 0-2 Wycombe. 79:38 Anthony Wordsworth takes a shot. Nikki Bull makes a save. 77:53 Foul by John White on Kevin Betsy, free kick awarded. Direct free kick taken by Nikki Bull. 77:18 Corner taken left-footed by Anthony Wordsworth, Dave Winfield makes a clearance. 77:03 Lloyd James takes a shot. Nikki Bull makes a save. 76:17 Effort from inside the area by Liam Henderson misses to the left of the goal. 74:32 Assist by Kieran Murtagh. 74:32 GOAL - Kevin Betsy:Colchester 0 - 1 Wycombe Kevin Betsy grabs a goal from inside the box low into the middle of the goal. Colchester 0-1 Wycombe. 73:23 Substitution Kieran Murtagh replaces Scott Rendell. 72:19 Lewis Montrose concedes a free kick for a foul on Lloyd James. Anthony Wordsworth takes the direct free kick. 70:15 Substitution Kayode Odejayi on for David Mooney. 67:20 Free kick awarded for an unfair challenge on Lewis Montrose by Anthony Wordsworth. Lewis Montrose takes the direct free kick. 65:32 Short corner worked by Ian Henderson. 65:22 Thomas Bender takes a shot. Save by Nikki Bull. 62:33 David Mooney gives away a free kick for an unfair challenge on Dave Winfield. Nikki Bull takes the free kick. 62:33 Substitution Thomas Bender on for Kemal Izzet. 62:33 Substitution (Wycombe) makes a substitution, with Chris Westwood coming on for Leon Johnson. 61:18 Substitution Stuart Beavon leaves the field to be replaced by Matt McClure. 60:48 The assistant referee flags for offside against Scott Rendell. Ben Williams takes the indirect free kick. 60:06 David Mooney is ruled offside. Free kick taken by Leon Johnson. 56:03 Scott Rendell challenges Lloyd James unfairly and gives away a free kick. Lloyd James takes the direct free kick. 54:50 Substitution Ashley Vincent goes off and Steven Gillespie comes on. 53:42 Shot by Ashley Vincent from outside the box goes over the net. 53:33 Ashley Vincent takes a shot. Blocked by Dave Winfield. 53:02 Corner taken right-footed by Scott Davies, save by Lloyd James. 52:47 Scott Rendell takes a shot. Save by Ben Williams. 52:10 Kevin Betsy fouled by Anthony Wordsworth, the ref awards a free kick. Lewis Montrose takes the free kick. 51:20 Lloyd James takes a shot. Save by Nikki Bull. 47:50 Ian Henderson takes a shot. Save by Nikki Bull. 47:21 Ian Henderson fouled by Kevin Betsy, the ref awards a free kick. Free kick taken by Magnus Okuonghae. 46:09 Ian Henderson has an effort at goal from outside the area missing to the wide right of the goal. 45:40 Inswinging corner taken left-footed by Anthony Wordsworth played to the near post, clearance by Scott Rendell. 45:00+1:13 The referee blows for half time. 45:00+0:22 Corner taken left-footed by Anthony Wordsworth, clearance by Lewis Montrose. 45:00+0:12 Anthony Wordsworth takes a shot. Blocked by Leon Johnson. 44:52 Kevin Betsy takes a shot. Magnus Okuonghae gets a block in. 43:55 Free kick awarded for an unfair challenge on Kevin Betsy by Lloyd James. Scott Davies takes the direct free kick. 42:01 Anthony Wordsworth takes the outswinging corner, Ian Henderson produces a right-footed shot from just outside the penalty box that misses to the left of the target. 41:07 Shot on goal by Ian Henderson from just inside the area clears the crossbar. 40:37 Unfair challenge on John White by Marvin McCoy results in a free kick. Anthony Wordsworth takes the free kick. 38:58 Ian Henderson challenges Scott Davies unfairly and gives away a free kick. Nikki Bull restarts play with the free kick. 38:04 Ben Strevens produces a header from inside the area that goes over the bar. 36:36 Unfair challenge on Dave Winfield by David Mooney results in a free kick. Free kick taken by Dave Winfield. 33:48 The assistant referee flags for offside against David Mooney. Nikki Bull takes the indirect free kick. 32:15 Ian Henderson is flagged offside by the assistant referee. Indirect free kick taken by Nikki Bull. 31:42 Anthony Wordsworth takes a shot. 30:47 Inswinging corner taken from the right by-line by Anthony Wordsworth, Kemal Izzet takes a shot. Save made by Nikki Bull. 29:30 Anthony Wordsworth takes the outswinging corner, Header from close range by Magnus Okuonghae misses to the right of the goal. 23:08 Outswinging corner taken by Anthony Wordsworth from the left by-line, Ian Henderson takes a shot. Dave Winfield gets a block in. 22:57 David Mooney takes a shot. Save by Nikki Bull. 22:27 Corner taken by Anthony Wordsworth from the left by-line, clearance by Dave Winfield. 21:05 The referee blows for offside against Stuart Beavon. Ben Williams takes the indirect free kick. 19:09 David Mooney takes a shot. Dave Winfield gets a block in. 16:34 Ashley Vincent gives away a free kick for an unfair challenge on Andy Sandell. Direct free kick taken by Kevin Betsy. 15:46 Ian Henderson fouled by Lewis Montrose, the ref awards a free kick. Direct free kick taken by Matt Heath. 14:48 Foul by Matt Heath on Kevin Betsy, free kick awarded. Scott Davies takes the direct free kick. 11:42 Anthony Wordsworth takes the inswinging corner, Ian Henderson has an effort at goal from outside the box missing to the wide left of the goal. 11:25 Kevin Betsy takes a shot. Save made by Ben Williams. 10:02 David Mooney takes a shot from just inside the penalty box which clears the crossbar. 9:43 Ashley Vincent is flagged offside by the assistant referee. Free kick taken by Nikki Bull. 9:24 Short corner taken by Anthony Wordsworth from the right by-line. 9:13 Ashley Vincent takes a shot. Blocked by Andy Sandell. 8:28 Anthony Wordsworth has an effort at goal from long distance that goes wide left. 6:00 The referee blows for offside against Kevin Betsy. Ben Williams takes the indirect free kick. 5:01 The official flags Stuart Beavon offside. Ben Williams takes the indirect free kick.